She sacrificed all for love... and sacrificed others for beauty. Fueled by her love for a much younger man (Daniel Bruhl), the aging Countess Erzebet Bathory (Julie Delpy, who also directs) turns to desperate measures in pursuit of beauty and everlasting youth. Yet in the process, she risks losing her power -- and her sanity. William Hurt also stars in this Berlin Film Festival selection inspired by actual events -- and the persistent rumor that the countess ordered the deaths of 150 innocent victims. 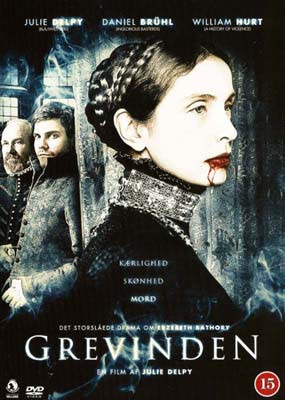 I am a huge Daniel Bruhl (Good bye Lenin!, Joyeux Noël, The Edukators) fan and was thrilled to discover he stars in the new retelling of the story of Countess Bathory. This is a horrifying tale based on the bloody exploits of the woman many historians refer to as the "Blood Countess" or the "Bloody Lady of Čachtice". A US release date hasn't yet been announced but I was able to save it for my Netflix queue! Thank you for the post. I'll be on the look out for it too. And I'll be at your interview tomorrow! Here's to an amazing 2010!